Perhaps the most underrated and over looked daily tool for the average person is that of a good quality pocket knife. While not as glamourous and flashy as a concealed carry pistol, the pocket knife often comes into use daily from everything from common utility applications to self-defense. 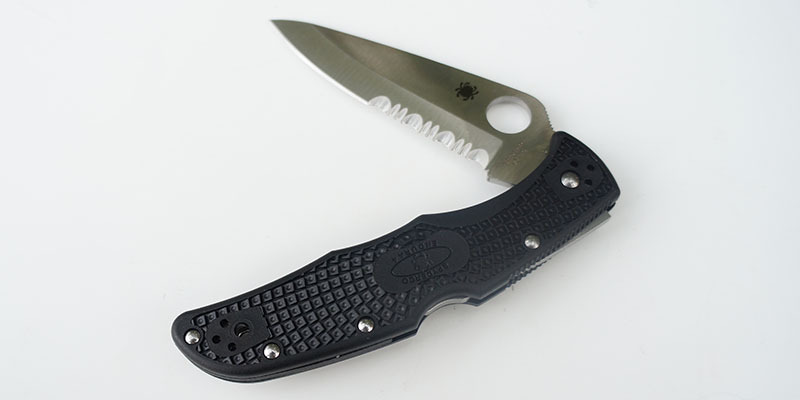 For over 35 years, the Golden, Colorado based company, Spyderco has been producing reliable knives for everyday carry. Founded by Blade Magazine’s Cutlery Hall of Fame member, Sal Glesser. 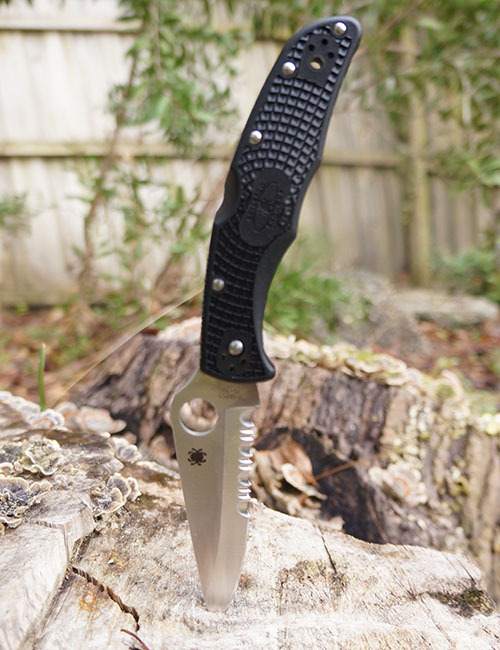 With two innovative key features, Spyderco has grown into a staple of the practical / tactical market. As a former Law Enforcement Officer, now current firearms instructor and gun writer, I am often asked to recommend a good carry knife. For all around durability and price, the Spyderco Endura is usually my first suggestion. The Spyderco Endura is a large, folding knife with a sturdy lock back to secure the blade in the open position while working. Over the years, the Endura has proven itself to be a tough, fully functional blade in the line of duty and the rare off day when I would enjoy hunting and need to field dress game. Based on a personal history with this model knife, I thought it would be a good chance to put into writing some of the things I have told those students and friends searching for their everyday carry knife. First let’s take a look at the specifications listed below and go from there. With an overall length measuring 8.75”, the Spyderco Endura offers the user a full size practical knife with a compact folding configuration. The overall weigh comes in under 4 oz. which will not weight down your pocket or take up much room with its narrow profile. The handle is strengthened with dual skeletonized stainless steel liners that make an anchor for all external and internal components to attach while adding sturdiness and rigidity. Phosphor bronze bushings on the blade’s pivot smooth out the action to produce one of the easiest opening and closing knives in the industry. The curve of the FRN or Fiberglass Reinforced Nylon handle fits perfectly in a wide range of hand sizes while providing comfort and retention in even the wettest of conditions. Currently, the Endura’s FRN handle is offered in the traditional black, blue, brown, gray, green, orange and purple to meet anyone’s taste in carry color. Outsourced to Japanese manufacturers in Seki-City, the Endura’s flat saber-ground blade is constructed of VG-10 steel hardened to around he RC60 mark. The benefits of this steel come with its durability and blade retention qualities while still being about to easily take a very fine edge. 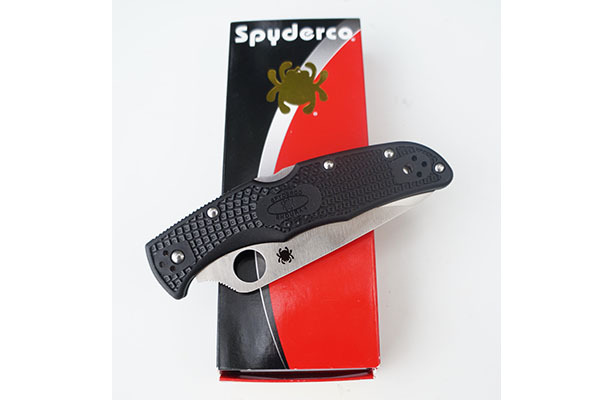 The corrosion resistance is that of one of the best in the Spyderco catalogue of products. Featuring the innovative signature Spyderco ambidextrous thumb hole, the blade can quickly be deployed with either hand. 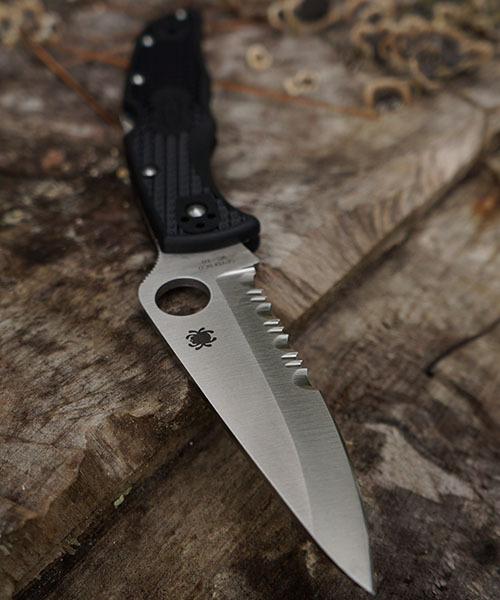 Offered in 3 standard options, the Endura comes in either a plain edge, fully serrated edge marketed as the “Spyder Edge” and my personal choice, the partially serrated edge which offers the clean, functional cutting ability of a plain edge with the tough use cutting of a full serrated for egressing a vehicle via cutting a seat belt or snagged clothing. One of the first tasks my Endura would have to perform very early in my Law Enforcement career was to cut through a set of rubber cargo straps while standing balanced on a car in a 100+ degree storage shed to lower a middle-aged man down from the rafters. Sadly, this gentleman had hung himself in a fit of depression brought on by heavy alcohol abuse. This was not a situation in which I needed to worry about if my knife was up to the task nor did I need to be going about my duty slowly in a delicate family situation in which it caused. The blade did its job quickly and efficiently, allowing me to do mine as professionally as the matter would allow. Along with the thumb hole, the fully reversible metal pocket clip is one of the reasons this blade is a top recommendation of mine. Spyderco not only fully accommodates right and left hand users but also those who prefer either tip-down or tip-up carry. This is an area I can personally attest to having come a long way over the 20+ years I have carried Spyderco products. In the early days, these clips would break in only a few months of getting beat and banged protruding from the pocket of your favorite jeans. Even then, Spyderco would only be a phone call away and more than happy to ship you a new clip. The clip on the last Endura I carried every day endured over 10 years of hard use without breaking. Retailing for around $114, the Endura can often be found for sale under the $80 mark. This offers two advantages for the consumer market in my opinion. You not only get a great quality knife at a price that won’t break the bank if it falls off the edge of your boat while changing lures fishing, it also comes in at a great price point for the first-time knife buyer looking for the best value for his or her hard earned dollar. The Spyderco Endura may not be able to saw through beer cans all day and then slice your tomato paper thin like much more expensive blades on the market, but for the same price, you can afford to purchase an Endura for your car, your daily carry, your wife, and still afford to gift one to a loved one for a birthday or Christmas. I highly recommend the Spyderco Endura of anyone looking for a good blade at a great value.